Sterilize your canning jars (1/2 pint size) or containers either by immersing them briefly in boiling water or running them on your hot water/sterilize dishwasher cycle. Put half of the blueberries in a blender or food processor along with the pectin, water and sugar and blend until the blueberries are well pureed. 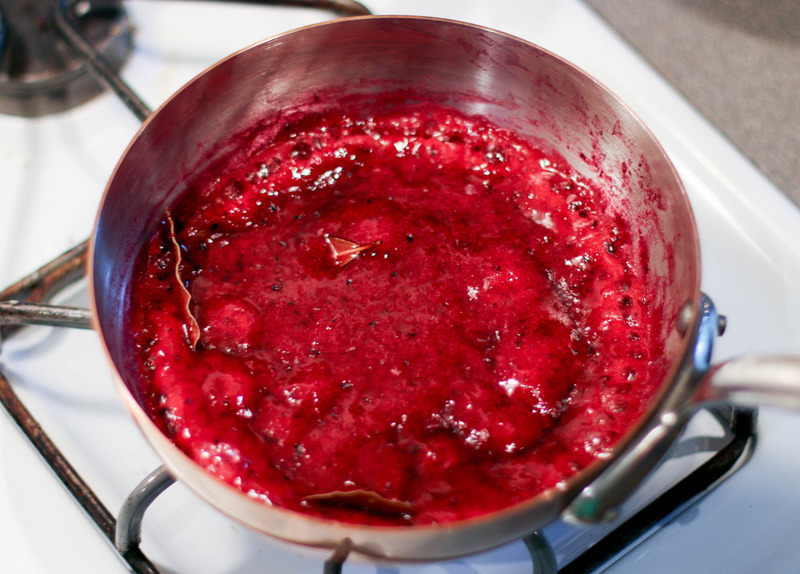 Pour blueberry puree into a small saucepan and add the bay leaves. Turn the heat to medium and whisk constantly until the mixture comes to a rolling boil (3-5 minutes). Immediately take off the heat and remove the bay leaves. Add the lemon juice and reserved fresh blueberries and stir with a spatula to combine. Pour into canning jars, seal and refrigerate immediately. It should be ready to use within 2 hours. This fridge jam will keep 2-3 weeks as long as it is refrigerated. It will most likely be safe to use for longer, but this is the most conservative window for safely using this jam.